Maymont House - Richmond's best kept secret! This attraction is absolutely wonderful. I’d say it’s the best kept secret in Richmond, but that’s not exactly true. The locals know and love it. It’s just the out-of-towners who don’t realize what a gem they’re missing. So I’ll do my best to let you in on the secret. Maymont has something for everyone, at a price that can’t be beat. It's the perfect spot for a cheap weekend getaway. Run by a non-profit foundation, admission fees are by donation, so--with perhaps the exception of house tours (see below)—you could easily enjoy a full day there without paying a thing if you were so inclined. However, it offers so much, I’ll bet you won’t leave without feeling like you should be donating something, simply out of gratitude for the great day you’ve had. (Just compare it to what you'd pay to see at Monticello, Colonial Williamsburg, Jamestown Settlement, and other historic attractions). Maymont is what they call “a Gilded Age Estate,” one of those huge mansion estates owned and enjoyed by the titans and “robber barons” of the 19th century. These wealthy Americans worked hard, made millions, and enjoyed the spoils of the Industrial Age before the 20th century and the horrors of income taxes and estate taxes took their toil and made the upkeep of these palatial estates prohibitive. Built in 1893 by railroad magnate James Dooley and his wife Sallie, Maymont was their home for three decades. Having no children (who might not have been able to afford the upkeep anyway had they existed) Sallie left it to the city of Richmond to be open to the public upon her death, which occurred in 1925. 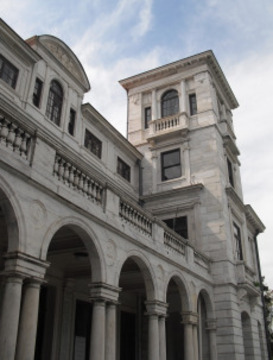 Don't miss the Dooley's other mansion, Swannanoa, on the Blue Ridge Parkway. Maymont’s 100 acres include the house, barn and carriage houses, a Nature Center, a Children's Farm Barn, wildlife exhibits including bears, bison, and bobcats, and acres of beautiful, kid-friendly gardens...the ideal spot for a family vacation getaway. The tour of the 33-room mansion takes about 45 minutes. Our guide, Beverly, was extremely informative and never made us feel rushed, despite our group’s many questions. She shared many intriguing facts about the house and the Industrial Revolution which made estates like this possible. For example, in 1860, there were only 4 millionaires in America. By 1892, there were 4,000. James Dooley was one of them, and his house was a showcase for it. It was one of the first houses in the area with electricity and central heat, and boasts fine antiques, beautiful woodwork, and different stained glass transoms, decorative ceilings, and color schemes in every room. The aluminum light fixtures and decorations - at the time, aluminum was extremely expensive and a real sign of social status. Who knew? For a small donation, the House Tour gives you a guided tour of the first and second floor of the mansion. A self-guided tour of the basement (kitchen, pantry, ice room, laundry, maids’ rooms, etc.) is free. Even if you decide not to take the house tour, don’t miss the basement, which is full of fascinating photos, videos, and explanations of what life was like for domestic servants in the mansion. And to see what might have happened to the house had it not be donated to Richmond, be sure to visit the Dooley's summer "cottage," Swannanoa (reportedly haunted) near Charlottesville. It's a great place to stop off before heading to Staunton and Blackfriar's Playhouse Shakespearean theater. Don't miss the wonderful gardens! These stairs lead down to the Japanese Gardens. When we take our kids on our next visit to Maymont, we’re expecting that their favorite part will be the gardens. Vast, imaginative, and varied, the gardens are full of hidden pathways and nooks and crannies that they will just love. The Italian Garden is very manicured and gives the feel of being in an Italian loggia. We were there in March, so not a lot was blooming, but I’ll bet it’s spectacular in spring. 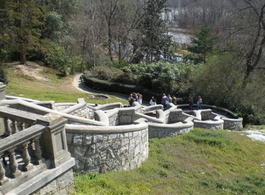 From the Italian Garden, walk down the snake-like parallel steps which border what is now a dry fountain. At the bottom you’ll enter the Japanese Garden, a huge area full of bamboo passages, little lakes flanked by mini Japanese “temples,” bridges, and big round stepping stones which you use to hop over the lake. A friend told me that they’ve had birthday parties here, including one where they planted clues and goody bags in the Japanese garden. The kids had a blast finding the clues and running around to get their goody bags. I know our kids will go crazy over this when we bring them. The Nature Center building houses nature exhibits including a 20,000 gallon aquarium and kid-friendly interactive displays (lots of buttons to push) on the James River flora and fauna. 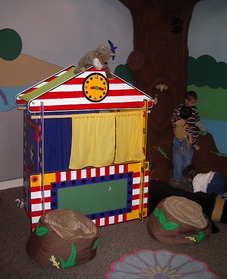 There is a kids playroom with lots of stuff to touch and play pretend. 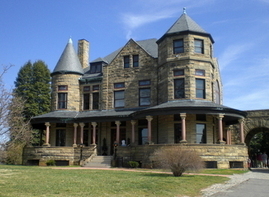 It also houses a small display of some Maymont artifacts and interactive historic displays. The lovely Gift Shop has many cute and unique items for sale. Our favorite? Three-inch-long dried fish scales which can be used as natural fingernail files. They're really weird looking...and they work! They also have a small café which has surprisingly good, made while you wait sandwiches at very reasonable prices. Paul enjoyed his Cheese Steak roll up, while I had the Tarragon Chicken Salad with raisins and walnuts. I’m not usually a chicken salad fan, but the menu was meat heavy, so I chose it by default and was very pleasantly surprised to find it huge and probably the best chicken salad I’ve ever had. All sandwiches (which come with chips) are $7-$8. On a nice day, be sure to eat outside on the terrace and enjoy the view of the park. As we sat there, we saw kids shrieking with joy as they rolled down the opposite hill. Since we didn’t have our kids with us, we decided to skip the Children's Farm Barn, but we could see the bison grazing and cows grazing as we walked past on our way back to the house tour. As I mentioned, Sallie Dooley’s will kindly donated the estate so that the people of Richmond could enjoy it. Very noble, but when she died in 1925, they realized that she’d neglected to leave any money for its operation (she felt that Richmond could more than afford it). So it has been left to the non-profit, private Maymont Foundation to foot the $2,000-$3,000 per day it now costs to run Maymont. Rather than charge a much higher, fixed admissionlike many similar attractions which offer less value (like Montpelier), the Foundation works very hard on ongoing fundraisers to foot a good portion of the bill. So when you consider that you could easily pay $10 or $12 or more to see similar historic estates elsewhere (and that’s just for the house tour), you realize that however much you decide to donate at Maymont’s various attractions, it’s quite a bargain. House: $5 per adult, $2 per child Open Tuesday - Sunday, 12 - 5pm. Guided tour start on the hour and half-hour (last guided tour is 4:30 pm). Self-guided tours of basement are open same hours as the house. Nature Center Exhibits: $4 per person Open Tuesday - Sunday, 12 - 5pm (Members get in at 10 am). Carriage Rides and Tram Rides: $3 adults, $2 for childrenOffered Sundays, April-October. Carriage Rides are from 12 - 4pm, by appointment year-round (weather permitting). Tram rides are available 12 – 5 pm, Tuesday - Sunday. Other Information:Indoor exhibits are closed on Mondays, and on Thanksgiving, Christmas and New Year's Day. Maymont Shop and Café are open the same hours as the Nature Center. In fact, the only fixed price at Maymont (other than buying things at the Gift Shop or Café) is the Tram, and carriage rides.We thought the tram fee was a bit steep and decided to walk. For us, this was the best decision for two reasons: 1) the distances aren’t that vast anyway; and 2) the tram wasn’t working that day. So unless you have some kind of physical limitation, skip the tram. The nearby Carytown section of Richmond has blocks of funky and eclectic shops and boutiques, as well as a satellite of one of our favorite restaurants, Baker’s Crust. Here’s why you HAVE to try one of their Nutella and chocolate crepes. 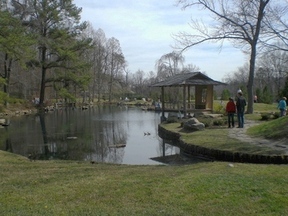 For an overview of other things to see in Richmond, click here.